Wüsthof Grand Prix II cutlery features precision forged high-carbon stainless steel blades for a long-lasting cutting edge that resist stains and corrosion. With Wusthof's Precision Edge Technology (PEtec) these extraordinarily sharp blades keep their edge 30% longer. 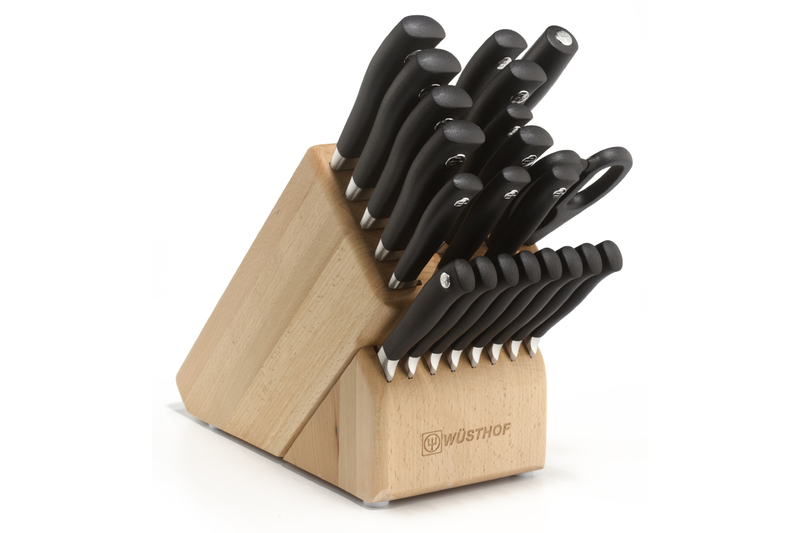 Each engineered for a particular task, the German-made knives in this set can handle everything from chopping vegetables to the most specialized chores like boning chicken. 3 1/2 inch paring knife. 4 1/2 inch utility knife. 5 inch serrated utility knife. 6 inch and 8 inch chef's knives. 8 inch hollow-ground slicing knife. Eight 4 1/2 inch steak knives.